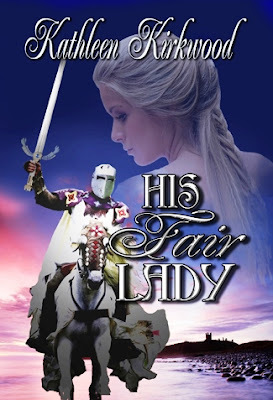 BookBub Promotion: His Fair Lady – FREE! I'm pleased to announce my October BookBub promotion. From today, Friday, October 2nd through Tuesday, October 6th, the e-book version of His Fair Lady is free to everyone on Amazon. Help yourselves and tell all of your friends. Enjoy! A maiden to be saved . . .
During the murderous assault on the village of Vaux , little “Ana” lost all she knew. Then suddenly, out of the burning wreckage, a young man appeared and rescued her from the horrors of the night. He proved to be a squire in a company of knights, on their way to join the Crusades. At a neighboring village, he delivered her into the care of a peasant couple who promised to love her. Before departing, he gifted her with something to remember him by . . . the silver cross from around his neck. A wrong to be righted . . .
After a decade of fighting in the east, Sir Royce de Warrene returns to England a celebrated knight. But he soon discovers the terrible mistake he made on that long-ago night. The orphan girl was no peasant child, but an heiress of noble blood — Lady Juliana Mandeville — and he deprived her of her birthright. He is charged with a quest — to find her at once and restore her to her grandfather — by order of the king! Love to be fulfilled, fated long ago . . .
Now grown to womanhood, the stunningly beautiful and saucy “Ana” refuses to believe the knight when he disrupts her wedding day, intent on taking her from those she loves and to deliver her to strangers at the English court. She grips the silver cross she wears, wishing her gallant squire could rescue her once more. Although she cannot remember his face clearly and never knew his name, she has not forgotten the night he saved her so long ago . . .